Our goal at the Kardinia Park Stadium Trust is to provide you with the kind of assistance and service excellence that will make your visit to GMHBA Stadium a safe, comfortable and positive experience. You will find GMHBA Stadium to be a user-friendly building with a customer service team that is trained to understand how to accommodate your needs. The following will give you helpful information on policies, procedures and amenities offered to make your visits with us memorable and enjoyable. For information or assistance on event days please visit the contact us page of our website. Automatic doors are located at the following GMHBA Stadium ground entrances – Sports House, Premiership Stand and Brownlow Stand. Braille signage is appropriately displayed on elevators, Brownlow and Premiership seat sections and restrooms. There are six passenger elevators to transport guests to all levels of GMHBA Stadium as well as ramps. A number of water fountains throughout the arena are wheelchair height accessible. All mens and womens toilets in Players Stand, Premiership Stand and Brownlow Stands have dedicated ambulant cubicles. There are also disabled toilets located throughout the venue. All disabled toilets in the venue are unisex and also feature a baby change table. Our changing places toilet can be found on level one of the Brownlow Stand. A parent/carer may nurse a child in any public location where they are comfortable and authorized to be. Nursing parents/carers seeking more discreet accommodations are welcome to use the Parents Room located on Level 1 Brownlow Stand. Breast pumps are permitted inside GMHBA Stadium. First aid stations can be found in the North: Breezeway of Ford Stand (Ground Level) and South: at the back of Players Stand (Ground Floor). Wheelchair and carer seating is available for all events at GMHBA Stadium, subject to availability. For AFL games we recommend you pre book your ticket via Ticketmaster by calling the accessible seating line on 1300 446 925. The Players Stand – 57 spaces and 57 carer/companion seats located on Level 1. Disabled access into the stadium is available throughout the venue and any of our friendly and helpful staff would be more than happy to assist. There is a lift located within the Premiership Stand providing access to Levels 1 and 3 with a disabled seating ticket. There is also a lift located in Sports House which provides access to Levels A, B and C of the Reg Hickey Stand. This particular lift is in a restricted entry point – patrons who need this lift must register prior to the match with the Kardinia Park Stadium Trust Management Team on 03 5224 9111. A public lift is located in the Players Stand providing access to Levels 1, 2 and 3. Disabled car parking is available on a first-in basis on event days. The dedicated disabled parking area is located at the northern end of the ground behind the Gary Ablett Terrace. Entry to the area is via Entrance E which is located directly off Moorabool Street. Individuals parking within the disabled area must have a valid disability parking permit on display. There are also a limited number of disabled car parks in the A2 and A3 car parking area which is located behind the Premiership Stand. Hearing loops are available in the Presidents Room and Deakin Cats Community Centre. Geelong Cats ticketing and memberships – accessible seating for Geelong Cats AFL home games can be obtained (subject to availability) either per game through Ticketmaster’s accessible seating line 1300 446 925 or on a season basis via Geelong Cats Membership Services team 1300 462 287. Patrons with companion cards must present the companion card when purchasing a ticket to AFL games. For more information, please contact Geelong Cats Membership Services team. For guests who have sensory sensitivity we have introduced our Sensory Zone initiative. The Kardinia Park Stadium Trust and Geelong Cats have partnered with US not for profit organisation KultureCity to improve our ability to assist and accommodate guests with challenges in processing sensory information. Our objective is to provide an inclusive experience for every guest. We strive to raise awareness of the needs and challenges faced by individuals with sensory processing challenges by supplying our staff, customer service and security members with training and by offering the resources and accommodations below to our guests. We thank our collaborating partners: Leisure Networks, Deakin University, BCYF, Barwon Paediatric Services, Kane Constructions, Latrobe Community Health Service, NDIS, G21, Gateways Support Services, Armstrong Creek School, Diversitat, Early Childhood Early Intervention Working Group, City of Greater Geelong and the Percy Baxter Charitable Trust managed by Perpetual. Sensory backpacks* containing fidget toys, noise cancelling headphones and other resources, are available for checkout (at no cost by leaving an ID) at the Geelong Cats Welcome desk (ground floor, Brownlow Stand) and Deakin Cats Community Centre (ground level, Players Stand). Our designated Sensory Room in the Deakin Cats Community Centre (ground floor, Players Stand) will launch for the AFL round 6 match. This includes a small multi-sensory room, within a larger quiet space. Guests utilising the Sensory Room are required to have a responsible person accompanying them at all times. Please contact us if you require assistance locating this room. COMING SOON – a social story to assist with your GMHBA Stadium visit. What sensory inclusive resources do Kardinia Park Stadium Trust provide? Do I need to be a Geelong Cats member to access any of the sensory inclusive resources during the AFL season? Do I need to pay to access any of the sensory inclusive resources? What are the main items that included in the sensory backpacks? How do I apply for the sensory backpack? Where/how do I pick up and return the sensory backpack? You will be required to provide your license or membership card (or other form of photo ID). Sensory backpacks are to be returned to the same collection point on the same day as the event. What and where is the Sensory Room? The Sensory Room is located in the Deakin Cats Connect Lab in the Deakin Cats Community Centre on the concourse of the Players Stand. The Sensory Zone has a small sensory room within a larger quiet space. Guests are welcome to visit the room before, during or after the game. The Sensory Zone is designed to enable guests to feel comfortable and in control during their time at GMHBA Stadium. How do I get to the Sensory Room? The multi-sensory room is opposite the Doug Wade Gate (western side of ground, opposite the pool). Do I need a reservation before using the Sensory Room? No reservation is required . However, be aware that at busy times there may be multiple users of the space. Is there any bathroom nearby the Sensory Room? Yes, facilities are 30m from the Sensory Room on the ground level concourse. Can I take my own food and drink into the Sensory Room? Water is most welcome, but it is a food-free zone. Yes, parental/guardian/carer supervision is required at all times. This is a formal requirement of the room. Do I need to sign up when I enter the Sensory Room? No sign up is required, however to ensure that we are providing the best possible experience, we would be grateful if anyone that accesses the space could provide an email address with view that you will be sent an survey by email to provide feedback after the match day. What is the purpose of a social story? 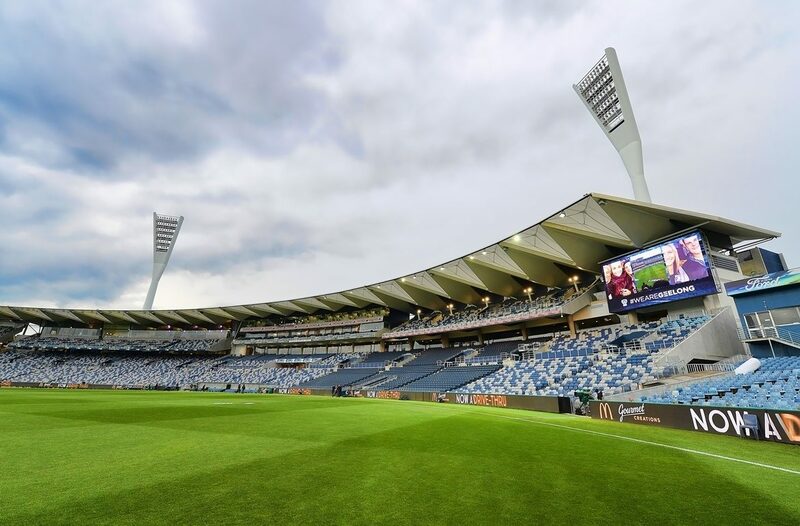 Kardinia Park Stadium Trust and the Geelong Cats have developed a social story with professional support from Deakin University, which aims to show guests what they may see and experience during a Cats home game. The social story has photographs and simple text and is read or shared with guests prior to attending. Many people find social stories can help prepare them and feel more comfortable about what they may experience throughout the day. Where can I download the social story? Coming soon! Guests can read the social story resource prior to attending by downloading the Word document and printing it out. Feel free to edit/cut/ paste your own photos and pages to create a script that best suits you and your day out. What else can I bring from home that may help my kids with sensory sensitivity? The following websites have some great advice/suggestions or talk to your healthcare provider. Please Contact Us if you have any questions before your visit to GMHBA Stadium. Our customer service team will be happy to help with any questions during any event at the Stadium.